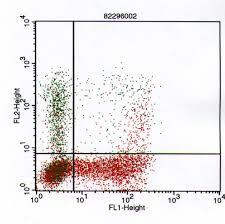 Cytokines function at the cellular, microenvironmental level, but human cytokine assessment is most commonly done at the macro level, by measuring serum cytokines. The relationships between serum and cellular cytokines, if there are any, are undefined. In a study of hospitalized patients in Malawi, we compared cytometrically assessed, cell-specific cytokine data to serum interleukin 2 (IL-2), IL-4, IL-6, IL-8, IL-10, gamma interferon (IFN-gamma), and tumor necrosis factor alpha (TNF-alpha) levels in 16 children and 71 (IL-2, -4, -6, -10) or 159 (IL-8, IFN-gamma, and TNF-alpha) adults, using Wilcoxon rank sum tests and Pearson’s (r(p)) and Spearman’s (r(s)) rank correlations. For the entire study group, correlations between identical serum and cellular cytokines mainly involved IL-8 and IFN-gamma, were few, and were weakly positive (r < 0.40). Blood culture-positive persons had the most and strongest correlations, including those between serum IL-2 levels and the percentages of lymphocytes spontaneously making IL-2 (r(s) = +0.74), serum IL-8 levels and the percentages of lymphocytes spontaneously making IL-8 (r(p) = +0.66), and serum IL-10 levels and the percentages of CD8(+) T cells making TNF-alpha (r(p) = +0.89). Human immunodeficiency virus (HIV)-positive persons had the next largest number of correlations, including several serum IL-8 level correlations, correlation of serum IL-10 levels with the percentages of lymphocytes producing induced IL-10 (r(s) = +0.36), and correlation of serum IFN-gamma levels and the percentages of lymphocytes spontaneously making both IL-6 and IFN-gamma in the same cell (r(p) = +0.59). HIV-negative, malaria smear-positive, and pediatric patients had few significant correlations; for the second and third of these subgroups, serum IL-8 level was correlated with the percentage of CD8(-) T cells producing induced IL-8 (r(s) = +0.40 and r(s) = +0.56, respectively). Thus, the strength of associations between serum and cellular cytokines varied with the presence or absence of bloodstream infection, HIV status, and perhaps other factors we did not assess. These results strongly suggest that serum cytokines at best only weakly reflect peripheral blood cell cytokine production and balances.